2X is a new and exciting product that will double the life of most nail polish. A clear coating, 2X is applied to your clean, bare nails prior to applying polish and again after applying your top coat. 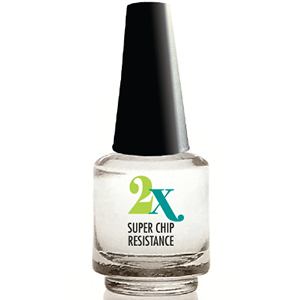 2X provides super chip resistance for most nail polishes. technology to invent a water-based nail polish, initially marketed 15 years ago as Go Natural, and since then rebranded and sold under a variety of names. One of them is Piggy Paint, a non-toxic, safe nail polish designed for little girls and their mothers. Piggy Paint is currently sold in Targets and Walmarts nationwide. Dr. Polston’s newest invention is guaranteed to make your life much easier. Market testing has proven that 2X will double the life of most polishes so that the user only needs to paint their nails half as often! We would like to hear from you. What is your experience? Take a photo of your 2X nails and show us your “Super Nails”. 2X is a lavender-infused clear coating that prevents most nail polish from chipping for an extended period of time. 2X dries very quickly so it won’t add any time to your manicure. It does not make removing your nail polish more difficult. Apply a thin coating of 2X to clean nails and then apply your polish and topcoat as you normally would. Once the polish is dry, apply one final thin coat of 2X on top and your spectacular long-lasting manicure is set to go. 2X has been proven to double the life of most nail polishes. Please let us know how 2X is making your life easier. So what is it like? 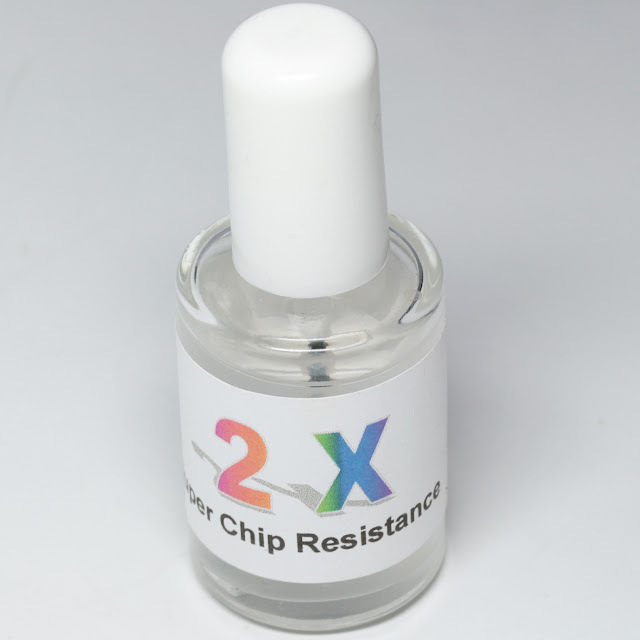 2X Super Chip Resistance comes in a normal nail polish bottle with brush. My bottle was a tester bottle so it is slightly different than the production model you would receive. I would call the formula watery with a chemical scent not like any other I have smelled - from what I read online, this might be the smell of ether. It dries down quickly then the scent dissipates. I reached out to the brand rep to get the ingredients and she e-mailed me back the MSDS sheet for the product, dated 2013, which indicates it has been in development for some time. It is comprised of 1-methoxy-2-propanol, or propylene glycol methyl ether. It is a solvent that is water soluble and is described as having very few toxic symptoms in humans, meaning it is generally safe at normal exposure levels. How did it work? I tested the product extensively for about a month under my regular base coat and came to the conclusion that it was indeed helping me with wear time. I normally don't wear my polishes for long, but when I do want them to last, I normally experience chipping within a day or two. Part of this is due to my thin, flexible nails, and part due to my bad habit of digging my thumb nail into my computer mouse - generally that is the nail that chips first. With 2X Super Chip Resistance, I was able to get at least two or three days of wear, which indeed doubled my normal wear time, without changing my bad habits. If I was more careful, I think this product might well help me reach 3-5 days from a normal mani. I would say that this product is a lot like drying drops - they definitely will definitely help you a bit with any slight formula issues, but will not work miracles. Just like drying drops will cut down on sheet marks on a slow-drying polish by about half, 2X Super Chip Resistance might help you don a mega-chipping polish for normal wear times. 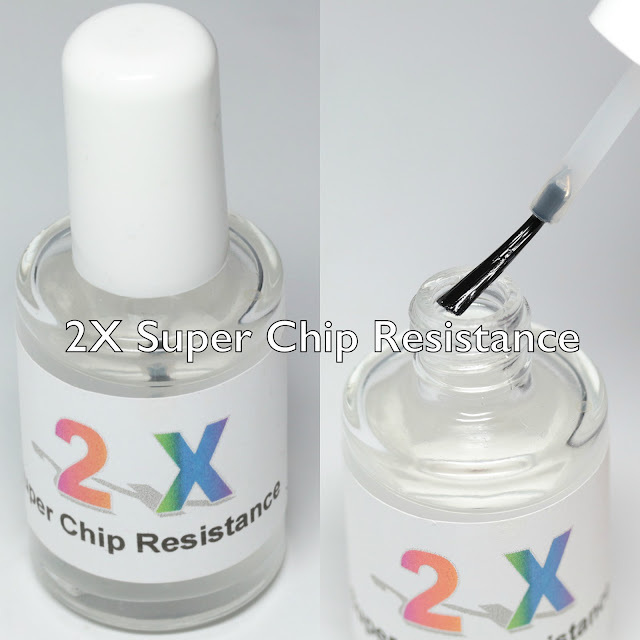 2X Super Chip Resistance just launched, and is available in their store for $5.99 plus flat rate $4.25 shipping. If chipping is a major problem for you, I certainly recommend giving this a try. Like drying drops, there is some added cost, but if it helps solve problems, it can be worth it. And a little goes a LONG way! I would say you could easily get a year out of a bottle of this if you use it every day. What do you think? Is chipping a big problem for you? Would you try a product intended to help with it?